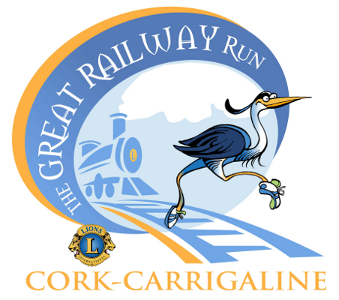 Carrigaline and District Lions Club have launched a new initiative in Carrigaline called “Message in a Bottle” which could help save lives. This scheme is already being operated successfully in other parts of the country and is fully supported by the emergency services. It involves writing your medical details onto a form which is put into a plastic bottle and placed in your fridge. A label, included in the bottle is then stuck on the door to indicate that the information is available. 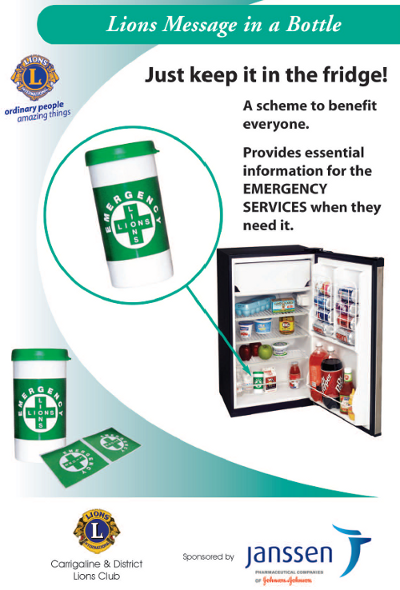 Fire and ambulance services are aware of the scheme and they will immediately be able to recover the vital medical details from the fridge in the event of an emergency call. The scheme should be of particular benefit to older people, those living alone or people having life threatening conditions/allergies. Bottles are available free of charge from various locations. Further details can be found here and a sample form for medical details can be downloaded here. We would like to thank Janssen in Ringaskiddy for their kind sponsorship of the scheme.